It's hard to imagine a more ideal rookie experience than the one Gabriel Landeskog is experiencing in Colorado. From his first NHL game to his first goal, the 19-year-old is having the time of his life, even in light of Colorado's struggles of late to win back-to-back games. Not only is the Swedish native playing for the same club that his childhood hero, Peter Forsberg, played for, but he is doing so with a poise that has caught the attention of his veteran teammates. In just 23 NHL games, Landeskog is quietly carving a niche for himself as something of a power forward in Colorado while averaging 17:36 of time on ice per game. "Right from the start of camp, he seemed very comfortable playing against guys who have played in the NHL and he's definitely proved that in these first  games," Daniel Winnik, Landeskog's linemate, told NHL.com. The 6-foot-1, 204-pound wing may not be a flashy playmaker but he registered 21 NHL games before he celebrated his 19th birthday Wednesday. In that span he notched 10 points (five goals) and he currently leads the Avalanche in shots (77) and in hits (55). According to teammates, he approaches the game with a physicality and hockey-sense that boast a maturity beyond his years. "He's a very smart player, gifted offensively and defensively," Winnik said. "He's just a really good all-around player. And I think a lot of that has to do with his hockey smarts." It was his acute hockey sense that helped him score his first NHL goal October 12 in a dramatic fashion. The Avalanche were down 2-1 to the Columbus Blue Jackets when Colorado opted to pull the goalie and add an extra attacker. Defenseman Jan Hejda rifled a shot from the point and with 40 seconds left in regulation, Landeskog deflected the shot past Steve Mason to tie the game at two, and Matt Duchene scored in the shootout to give Colorado the victory. "You always dream about scoring in a crucial moment of a game," Landeskog told NHL.com following that game. "So it was a huge relief for me -- and for the team as well. To get my first NHL goal that way was just a bonus." They don't have a catchy phrase to always be associated with like "Taylor vs. Tyler," but the first two picks of the 2011 Entry Draft will square off Saturday night at Pepsi Center, and both have been critical players for their teams despite being 18 years old at the start of the campaign. While Gabriel Landeskog has been solid for the Colorado Avalanche and leads the team in shots and hits, Edmonton's Ryan Nugent-Hopkins has been outstanding for the Oilers. Nugent-Hopkins has been collecting points at an incredible clip of late, and the Oilers remain among the top eight in the Western Conference. The kid known as "RNH" leads all NHL rookies with 10 goals and 24 points, and he's tied with veteran Ryan Smyth for the most points on the Oliers. 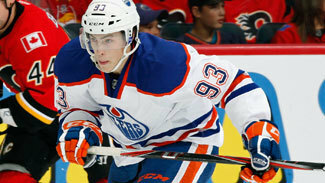 Nugent-Hopkins has been especially hot of late – he has 10 points in the past four games. Only four other players in NHL history have recorded 10 points in a four-game span – Wayne Gretzky (1979-80), Dale Hawerchuk (1981-82), Trevor Linden (1988-89) and Sidney Crosby (2005-06). Nugent-Hopkins had five assists Nov. 19 against Chicago, a goal two days later against Dallas, two assists against Nashville on Tuesday and then a pair of goals Thursday to help the Oilers snap a 17-game losing streak at Minnesota's Xcel Energy Center. Only five players have reached 80 points in their first NHL season in the past two decades – Crosby and Alex Ovechkin in 2005-06, Evgeni Malkin in 2006-07, Mikael Renberg in 1993-94 and Teemu Selanne in 1992-93 – but Nugent-Hopkins is on pace to be the sixth at the quarter-mark of the season. Although the blonde-haired, blue-eyed Swede grew up watching fellow countrymen the likes of Forsberg, Nicklas Lidstrom, and Mats Sundin, he is developing his own identity in the League thanks to his physical play and eagerness to crash the net – something Colorado especially needed after trading Chris Stewart to St. Louis last season and losing Brandon Yip to injury for the first part of the season. However, there is really no comparison to be made between the style of Landeskog and that of the former Calder, Ross and Hart trophy-winning Forsberg. In fact, In Forsberg's rookie season, he notched 15 goals and 50 points in only 47 games before following that up with a career-best 116 point campaign (30 goals) in 1995-96. Landeskog knows he plays a very different style than Forsberg. "For me, this is my way to play the game and this is how I become successful, I guess," Landeskog said. "It's about finishing your checks. It's not about going out there and hurting someone, it's about eliminating people from the puck and making sure our team gets momentum." Landeskog's willingness to play the body and knock others off the puck has not gone unnoticed by teammates. "He doesn't shy away from a hit," Winnik said. "He will take big hits to make plays and he's been popped a couple times pretty good so far this season, and I think that's just a part of the player he is." But still, there is something magical about playing for the same team as his childhood hero. In fact, after Landeskog was selected with the No. 2 pick by the Colorado Avalanche in the NHL Entry Draft in June, he received a phone call from his hero. "I was speechless at first," Landeskog told NHL.com. "I didn't know what to say really when he called me, but it was fun and he seems like a great guy. "It's pretty ironic when you think about it, how he was my No. 1 idol growing up and then I end up playing in the same jersey as he did. It's a pretty neat experience to be honest with you…so I'm very thrilled to be here." Landeskog also had the privilege of playing his first NHL game on the same night that Forsberg's number was raised to the rafters at Pepsi Center. It was also a game against the Detroit Red Wings, and so on his first night in the NHL, Landeskog faced off against another of his childhood heroes in Nicklas Lidstrom as well as fellow countrymen Henrik Zetterberg and Johan Franzen. "(Lidstrom) is one of the biggest guys that all Swedish kids look up to," Landeskog said. "It was a pretty neat experience to play against him on the first night of my NHL career and I have a hard time seeing myself getting used to playing against him every night. "It was a special, special night to say the least, I mean not only to be a part of that but to play my first NHL game in that environment and with that ceremony and everything it was a pretty neat experience and it's something I will remember for a very long time." The scouts were certainly right about Landeskog when they predicted that the left wing would be ready for the NHL this season after tearing it up with the Kitchener Rangers in the Ontario Hockey League last season with 66 points (36 goals) in 53 regular-season games. "Every day I'm having a lot of fun and I'm playing with all these guys and sitting in the same locker room as the [Milan] Hejduk's and the [Paul] Stastny's and the Matt Duchene's and Ryan O'Reilly's and Erik Johnsons. I'm learning a lot every day, that's what makes it so much fun too, when you're playing against the best players in the world."